One goal of estate planning is to protect yourself during your lifetime from potential scams and financial abuse. Florida is well-known as a haven for the elderly. Unfortunately, this also makes Florida a magnet for unscrupulous individuals who try and take advantage of the elderly. Many elder abuse scams actually take the form of offering estate planning or financial services. The scammers convince victims to pay them thousands of dollars–but then never deliver the promised services. Such abuses are widespread enough that Florida state officials have noticed and are now taking action. For example, earlier this year the Florida Attorney General’s office filed a civil lawsuit against a Broward County couple who allegedly stole a quarter of a million dollars from senior citizens throughout the state. According to the Attorney General’s complaint in Office of the Attorney General v. Kydes, filed this past February in Broward Circuit Court, the defendants operated a company, Senior America Home Care, Inc., which purportedly sold “in-home personal care and companion services” to senior citizens. The defendants allegedly made “unlicensed door-to-door sales” calls on elderly residents and used “information regarding the seniors’ insurance policies or care programs” to garner their trust. The defendants then pushed seniors to purchase “year-long packages” for care services where the buyers were “prohibited from using the services during the first six months of the contract.” The Attorney General said the defendants did not provide a fixed rate schedule for these purported services, but rather charged “whatever amount they can convince senior consumers to pay,” which ranged between $17 and $40 per hour. In one case, the Attorney General’s office cited the example of an 88-year-old woman living in Fort Lauderdale. The defendants sold her home care services on multiple occasions, despite the fact she “had not used the hours she had previously purchased,” and in fact already had care-service hours available under a pre-existing long-term care insurance plan. Yet not only did the defendants continue to sell her additional hours–they nearly doubled the hourly rate charged. Overall, the Attorney General’s office alleged that less than 5 percent of the money collected from the defendants’ customers were actually “used to provide services to seniors.” The bulk of the funds were diverted to the defendants, or affiliated business entities, for their personal use. The Attorney General’s office alleged these actions constitute “deceptive practices” under Florida law. On May 21, the Attorney General’s office moved for default judgment against the defendants. The next day, the defendants filed a formal answer denying the allegations in the complaint. The case remains pending before a Broward County judge. Aside from deceptive trade practices, it is also considered elder financial abuse to deprive a “vulnerable adult” of their property via fraud. Once again, proper estate planning can help protect against such abuse by ensuring there is a designated agent available to manage a vulnerable adult’s personal and financial affairs. 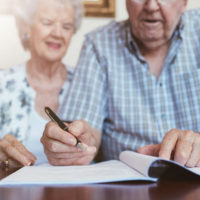 If you need advice on preparing such documents, or dealing with elder abuse in general, contact the Fort Myers estate planning attorneys at the Kuhn Law Firm, P.A., at 239-333-4529 today.